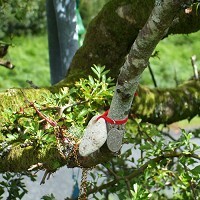 A symbol of magic in the Comeragh Mountains met its end last week, when vandals chopped down a fairy tree, which was the symbol of the magic road. Known well by the people of Waterford, the magic road gave the impression that drivers were rolling uphill without the power of the engine. An experiment carried out by WIT students in recent years showed that the magic movement was an illusion, but still people flocked to test the trick for themselves. Generations passed the story down to the next and the magic road was enjoyed by many visitors to the mountains over numbers of years, with the decorated tree acting as a marker for the enchanted spot. People in the area have been saddened and many others have taken to internet forums to speak openly about their anger at the loss of Waterford’s favourite tree, which was cut down last Tuesday night.